Cumin seed is used as a spice for its distinctive flavour and aroma, It is a preferred seasoning as it brings out the natural flavour of foods, also used to flavour stews, soups and vegetables. It is an indispensable ingredient in the famous Jeera Rice and Garam Masala. 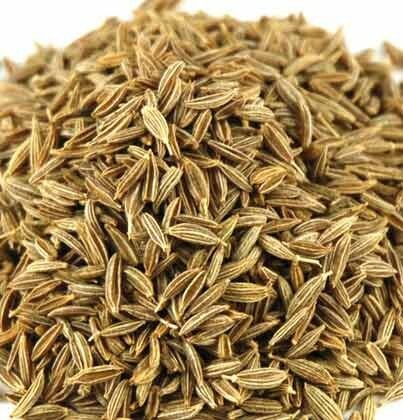 Cumin is a flowering plant in the family Apiaceae. The main producer and consumer of cumin seeds or jeera is India. It produces 70% of the world supply and consumes 90% of that (which means that India consumes 63% of the world's cumin). Cumin is a drought-tolerant, tropical, or subtropical crop. It has a growth season of 100 – 120 days. Cumin seed/jeera is used as a spice for its distinctive flavour and aroma. Cumin is one such spice that forms an integral part of various dishes in the Indian cuisine. Cumin can be used ground or as whole seeds. It helps to add an earthy and warming feeling to food, making it a staple in certain stews and soups, as well as spiced gravies such as chili. It is also used as an ingredient in some pickles and pastries. In Sanskrit, cumin is known as jeera/jira “that which helps digestion" and is called zira in Persian. Dried cumin seeds are believed to have medicinal purposes, in the Ayurvedic system. Jeera rice is a common dish in India which is prepared by roasting cumin seeds in butter, frying rice in it and cooking it with water. In southern India, popular drinks such as Kerala and Tamil Nadu are called jira water, which is made by boiling cumin seeds. Cumin seeds resemble caraway seeds in appearance. However, they are lighter in colour, hotter to taste, larger in size. Cumin seeds are an excellent source of iron, a mineral that plays many vital roles in the body. Cumin seeds has a high content of vitamin E which keeps your skin healthy and glowing. Vitamin E present in cumin seeds triggers the anti-ageing processes within the body. Cumin seeds helps to cures itchiness and body heat. Cumin seeds have traditionally been noted to be of benefit to the digestive system. Cumin seeds may also have anti-carcinogenic properties. Cumin seeds are rich in iron and thus very good for lactating mothers. Cumin seeds are rich in iron which is necessary for the formation of haemoglobin in the blood. Cumin seeds are rich in Vitamin C and has anti-fungal properties. Buy(order) Jeera or Cumin Seeds online at whole sale price from KiranaPlace, a online spice and seasoning shop.